Our Kraft pouches are ideal for displaying a variety of products whilst providing a natural feel to your packaging. Our Kraft pouches are lined with moisture resistant materials to extend shelf life. Whether you need a stand up pouch, 3 side seal pouch or windowed pouch, our specialists are on hand to help you. Kraft pouches, a popular type of stand up pouch, are widely embraced by many food manufacturers across the UK to help their product stand out in a competitive retail environment. What is a Kraft pouch? Kraft packaging has become somewhat of an industry standard when it comes to packaging food and beverages, especially when it comes down to showcasing organic products. Kraft bags have become popular due to their myriad of features – made from laminated PET and LDPE food grade materials, these pouches are extremely durable, efficient and easy to transport and store. Kraft pouches are a very resilient and puncture resistant form of flexible packaging, and can come in a stand up format to display more effectively on a retail shelf. This is why they are a favourite both with big food brands and independent food producers who want to showcase their products in superior packaging to emphasise their quality. Kraft paper food bags are convenient to use, as they allow customers to easily tear open and subsequently reseal. 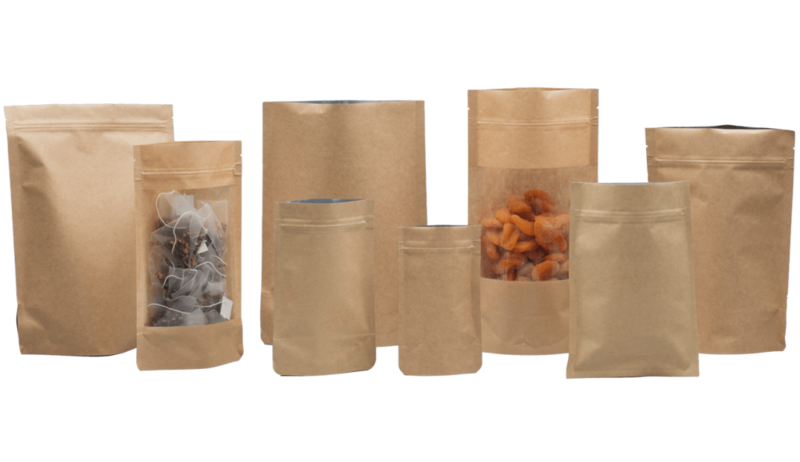 And, the pouches keep your products fresh longer as they are made of Kraft paper laminated with PET, LDPE which also happens to be eco-friendly. What are the benefits of Kraft pouches? If you are looking for something extra sturdy, flat bottom Kraft paper pouches are the perfect choice for you. These Kraft pouches offer exceptional sturdiness while maintaining the versatility of the packaging. Flat bottom pouches not only offer up retail shelf variety, but also have the added benefit of holding more product per square inch than other pouches! In addition to being able to determine the size and shape of your Kraft pouches, you can also choose whether they are windowed or not. To further increase your visibility in a retail environment, you can order printed Kraft bags with high quality designs guaranteed to catch your customers’ eye – Kraft packaging looks sophisticated, prints well and allows branding to stand out clearly. With environmentally conscious packaging gaining in popularity, Kraft bags are the perfect way to attract the more savvy customers who tend to be sceptical about the packaging of the products they buy and want only the best quality.